Every Halloween is just like that! For me, Halloween marks the end of our fall harvest season. The month of October has been full of gathering in crops, preserving window sill ripened tomatoes, storing patio furniture, raking leaves, heaping withered plants on the compost pile, taking down bean trellises and putting up glass cold frames. I have spent the last few days de-decorating our home, and garden, from its autumn array of red, yellow and orange. The stacked straw bales, which held assorted jack-o-lanterns and colorful squash, have moved to the garden beds for mulch. Corn and sunflower stalks, which stood in old milk cans, have headed to the chipper pile and the last pieces of trick-or-treat candy have been stashed for winter indulgences. 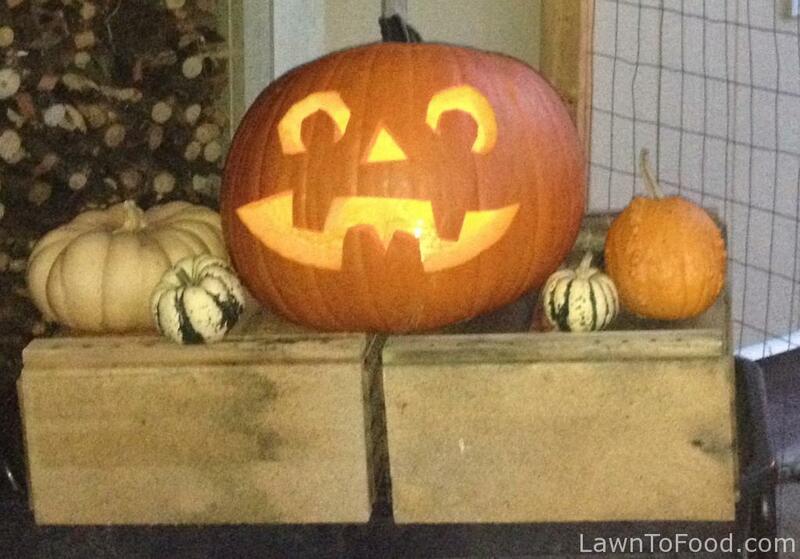 A few pumpkins, which have avoided spooky facial carvings, are about to meet my butcher’s knife. 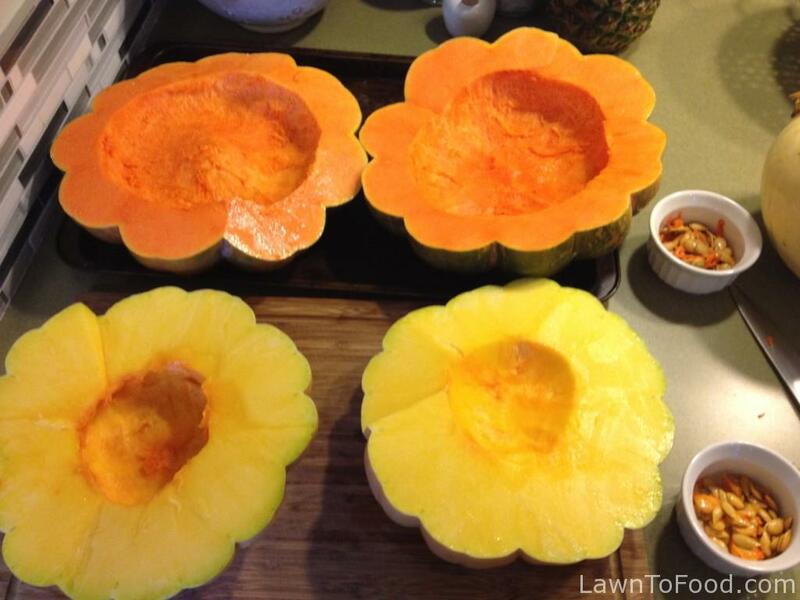 I’ll split open the squash, remove the seeds and roast them in the oven. Once the pumpkin is cooked, I’ll puree it up to use in many different sweet and savory recipes. This season, I purchased two Fairy Tale pumpkins (named after Cinderella’s horse-drawn carriage) when they were recommended for their dense, favorable flesh. One of them is pictured here on the left. The first Fairy Tale pumpkin that I sliced open, was a brilliant, rich color and smelled like “awesome watermelon”, according to our grandson, Brusselsprout. The deep orange color indicated plenty of Vitamin A (Beta Carotene) which is only one dietary health benefit of pumpkins. The second pumpkin was a different color but had the same vibrant scent. 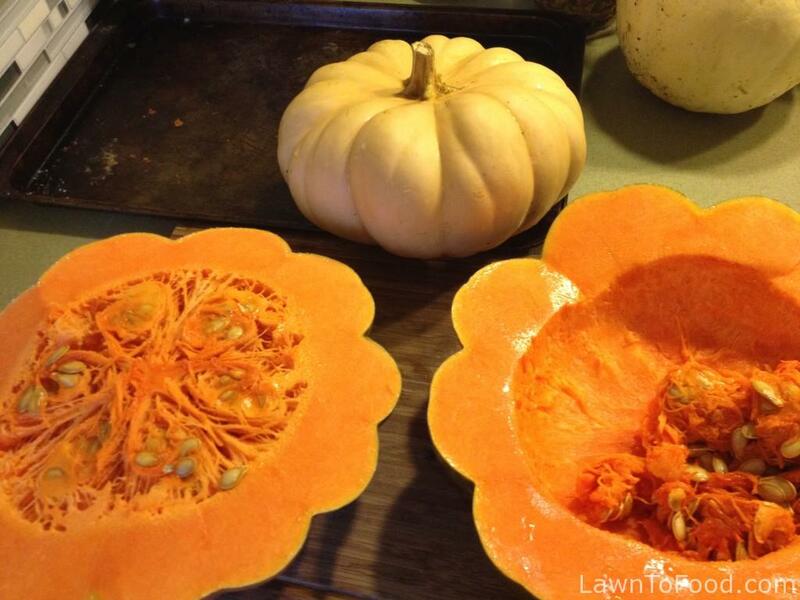 When eaten raw, both tasted like slightly-floral pumpkin with a crisp, crunchy texture. I decided to save some seeds from these treasures, even though I have learned that they will probably not produce a pure reproduction of the Fairy Tale variety. Members of the squash family readily cross-pollinate with each other, which doesn’t affect the current year’s crop, but does affect their seed. Seed suppliers isolate different squash varieties far away from each other, to prevent cross-pollination, which is difficult to do on small scale farms and in home gardens. The cooked pumpkin peel was easy to remove and went into the compost bucket. I baked the washed pumpkin seeds at 350F for about 15 minutes, after tossing them with a bit of olive oil, salt and pepper. Toasted pumpkin seeds make a great, crunchy snack food for movie nights. I pureed the roasted pumpkin in a blender and put it in a large bowl to rest. Typically, I have to pour off a bunch of fluid that accumulates after pureeing regular pie pumpkins, but not with these ones! The puree remained thick and ready for recipes, or freezing. First on my list of pumpkin things to make was Pumpkin Bread, which is one of my Hubby’s favorites. It turned out rich, moist and very flavourful. I froze some pumpkin bread slices, after wrapping them in waxed paper, and then sealing them in a ziploc bag. They will be great ready-to-grab lunch box items. Tonight, I am making spicy Pumpkin Soup that I’ll top with our garden arugula, a dollop of greek yogurt and some of those toasted pumpkin seeds. Delicious and nutritious! The remaining pumpkin puree is frozen in 1 cup portions. The small portions will be easy to thaw and use in pumpkin pie, muffin and cookie recipes. If I get adventurous, I’d like to try some of this pumpkin, instead of Butternut squash, in delicate ravioli or cannelloni. The sweet puree would also be a nutritional addition to spicy Indian lentils or chicken curries. 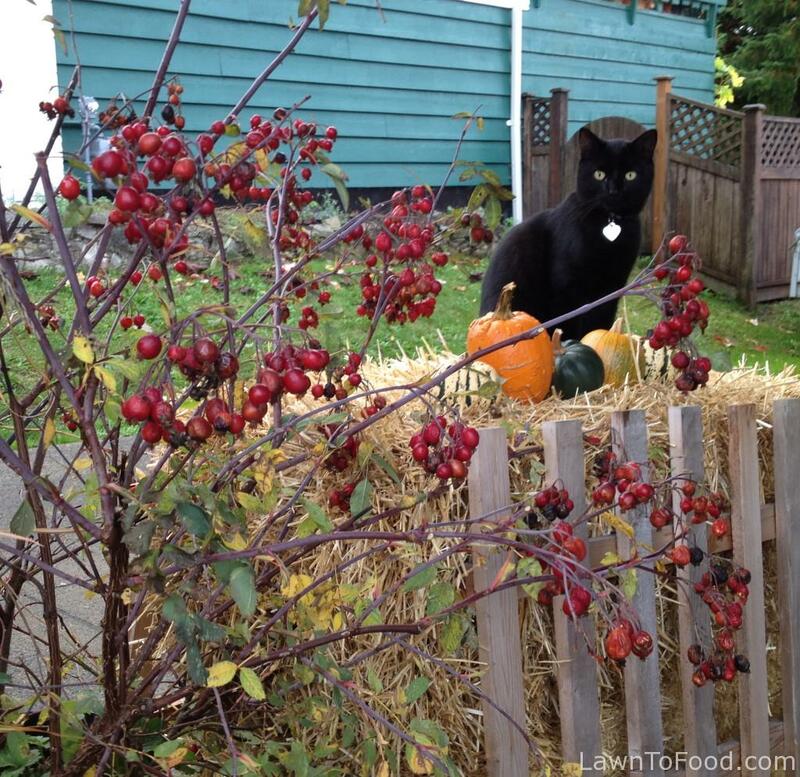 I hope that this little post will help inspire you to use what you can, from the abundant garden harvests, that happen around Halloween. 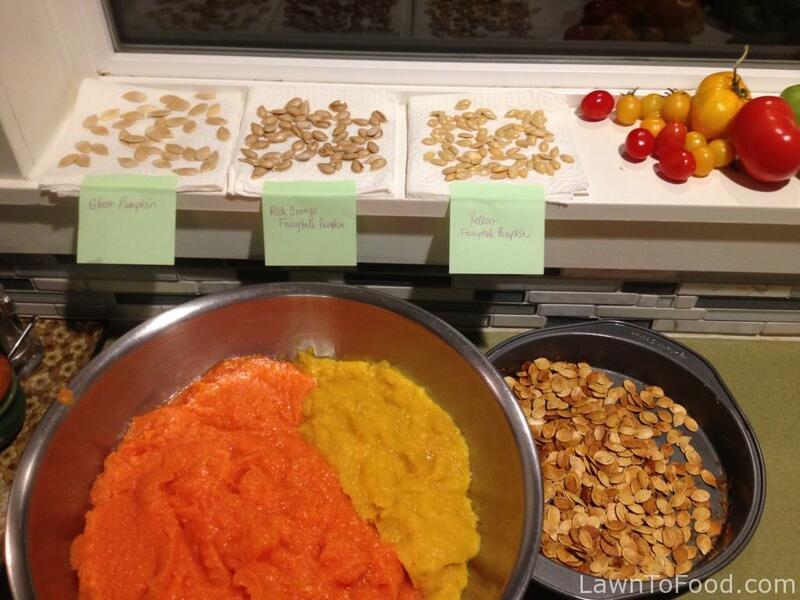 This entry was posted in Gardening w/ Kids, Growing Food, Preserving & Using Preserves, Reep the Harvest and tagged halloween, loaf, pumpkin, soup, squash by Lynda. Bookmark the permalink.